We found the some of the wildest rides at the 2018 Geneva Motor Show. Here’s our top six finds from this year’s show floor in Switzerland. When you think of the fastest cars on Earth, you think Bugatti, Koenigsegg, and of course Corbellati. Who? Never heard of Corbellati? 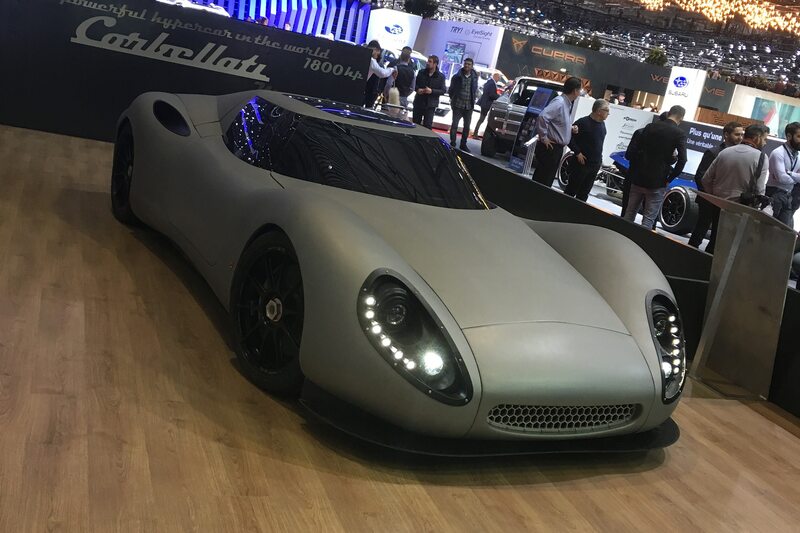 Neither have we, but the privately funded Italian startup is aiming its Missile (points for originality) at being the world’s fastest supercar with a terminal velocity of 500 kmh, or 310 miles per hour. Motivation for the Missile is provided from a race-sourced, twin-turbo 9.0-liter V-8 with a paltry 1,800 horsepower. 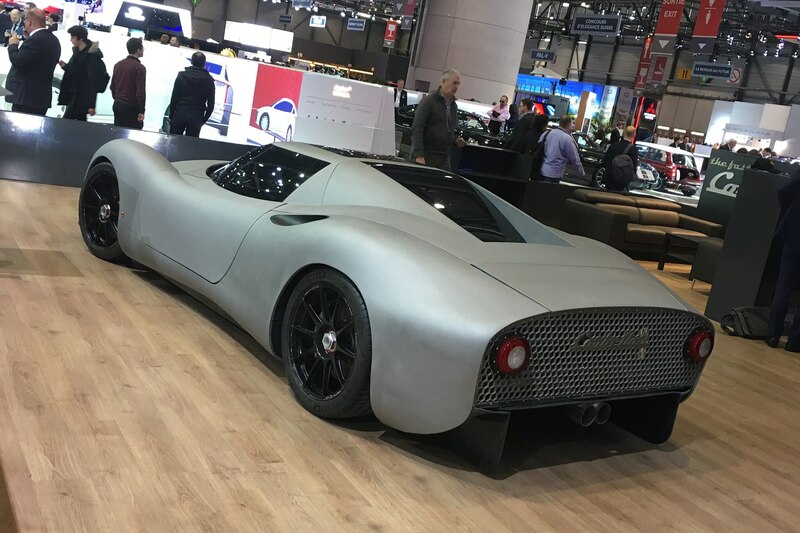 The car’s chassis is carbon fiber, as is its body. It’s the dream of the Corbellati family, and it’s just that, a dream. But hey, why not dream big? 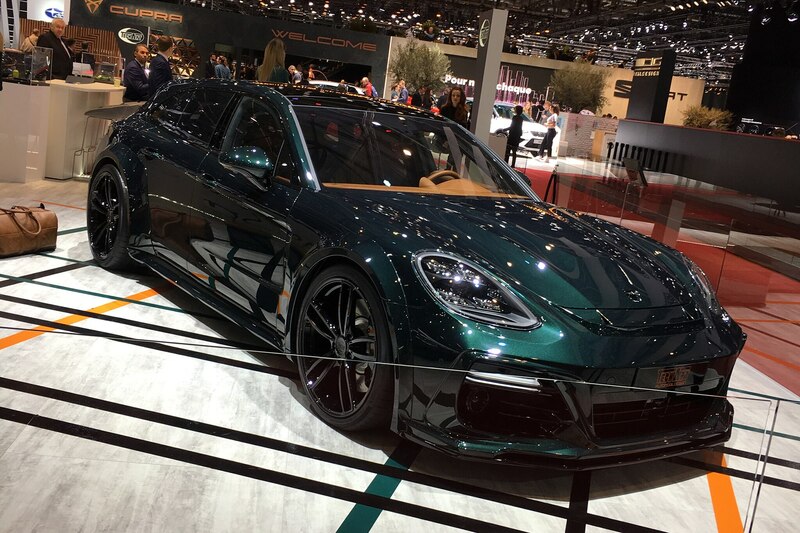 We’re already big fans of the Porsche Panamera Sport Turismo, and the Techart GrandGT Supreme takes an already killer machine to the proverbial next level thanks to a number of exterior enhancements, power upgrades, and a handcrafted interior. The car on the stand at Geneva looked mean decked out in its Racing Green livery, black, five-spoke 22-inch rims, and titanium and carbon exhaust system. The German outfit also boosts up the already potent Panamera Turbo’s engine output to roughly 640 hp and 664 lb-ft of torque. We’ll take our Sport Turismo with these supreme toppings anytime. 3. Flying Huntsman 6X6 Civilian Carrier by Kahn Design. 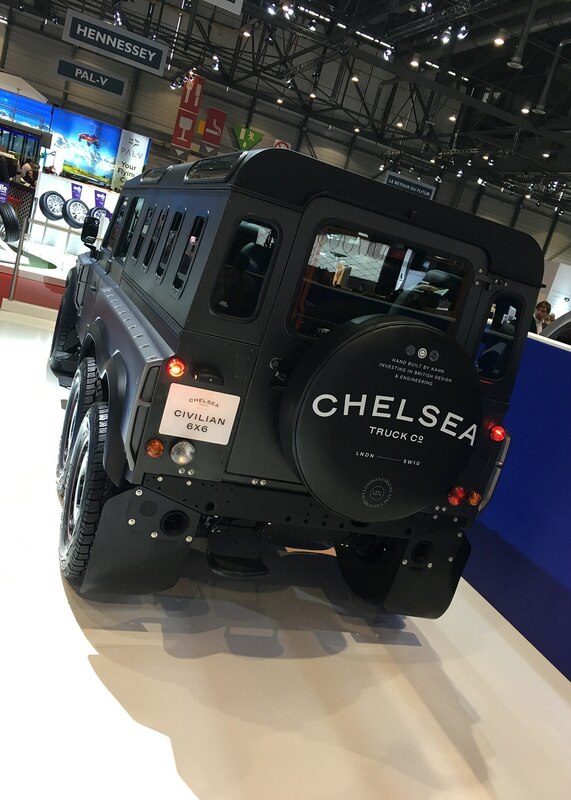 We’re suckers for anything with six wheels, and when we walked by this coach built monster based on a Land Rover Defender 110 sitting on the Geneva show floor, we stopped dead. 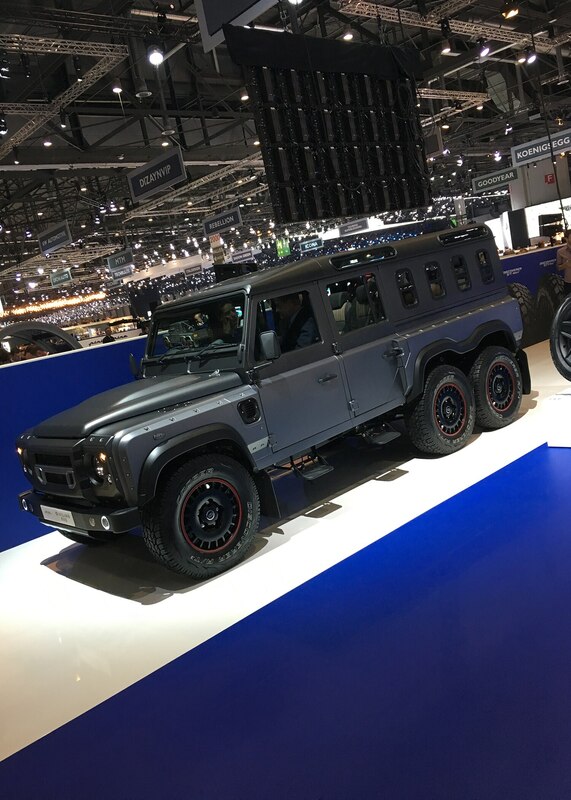 Created by the folks at Kahn Design, the Flying Huntsman is a concept vehicle that’s been designed to be eminently capable as well as luxuriously appointed and is the ultimate in Kahn’s Chelsea Truck Company line of modded Defenders. 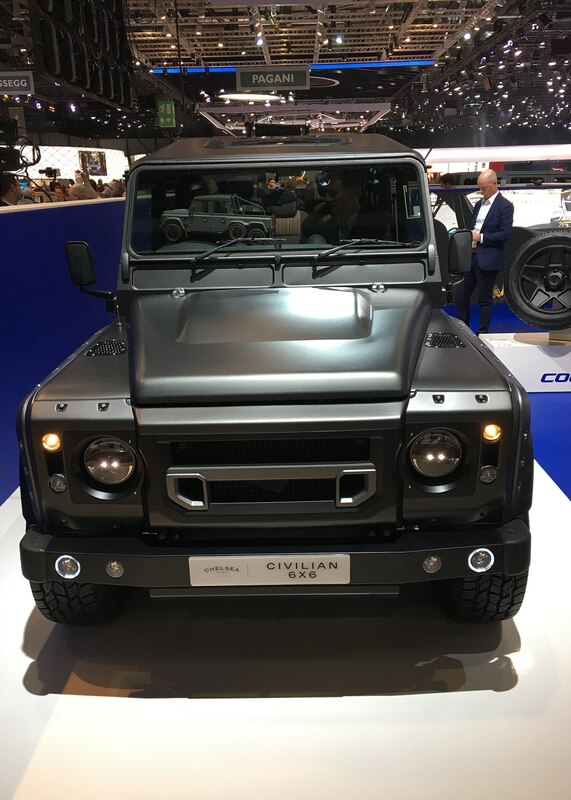 Kahn’s engineering team added the third axle, creating a two front-wheel and four rear-wheel configuration, using 18-inch Huntsman wheels shod with Cooper Tire LTZ 275/55/20 rubber (Cooper is an official sponsor of the concept). It deploys a heavy-duty Hi-Lo ratio drive system and locking differentials, and the suspension and braking system are among the components that have been reworked. The Flying Huntsman’s exterior is shod in a shade called Volcanic Rock, and it features several unique touches—front and rear wings and venting done in composite, and a unique front end treatment with LED headlamps, and a redone front bumper treatment. Kahn is known for its top tier interior trim work, and the Flying Huntsman has nine seats done up in quilted leather. The steering wheel is chrome, and the rear of the vehicle has a full panoramic roof aft of the B-pillar. 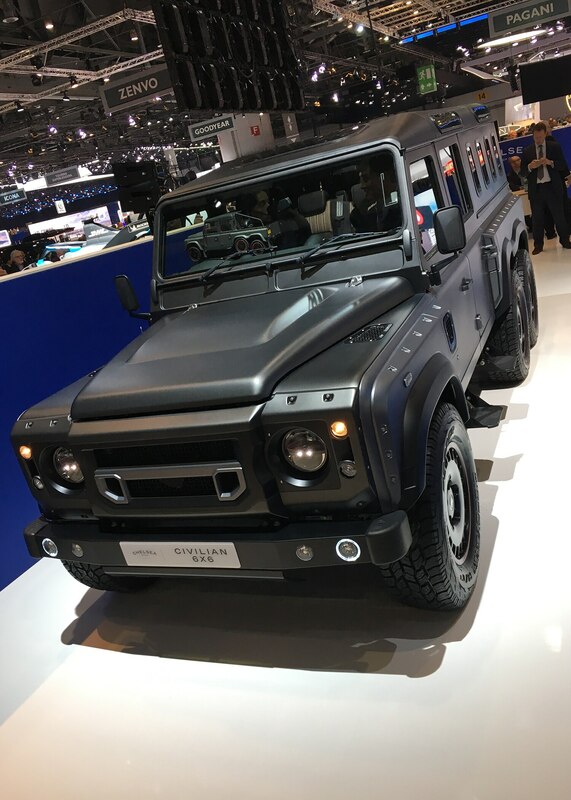 The Flying Huntsman is designed to be a conversion for a Defender 110 (they already offer a pickup 6×6) but you’re going to want the optional 6.2-liter V-8 with 430 hp. If you want Kahn to build you one, it will set you back about $350,000. 4. Speedback Silverstone Edition by David Brown Automotive. David Brown is a small British outfit of about 30 employees that has been busy creating automotive dreams of its namesake. 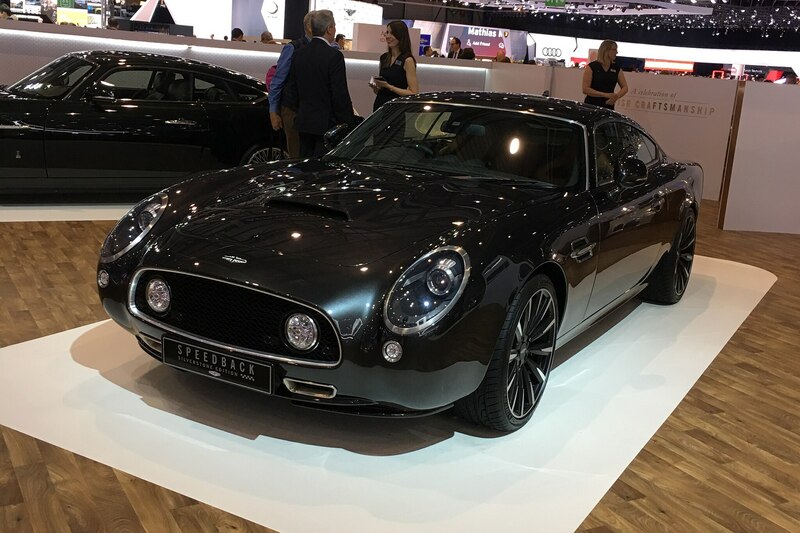 The company’s signature car is its Speedback GT, which is designed to harken back to Britain’s golden era of 1960s GT touring cars. The company has also recently branched out into making its Mini Remastered line of Mini recreations from a similar era. 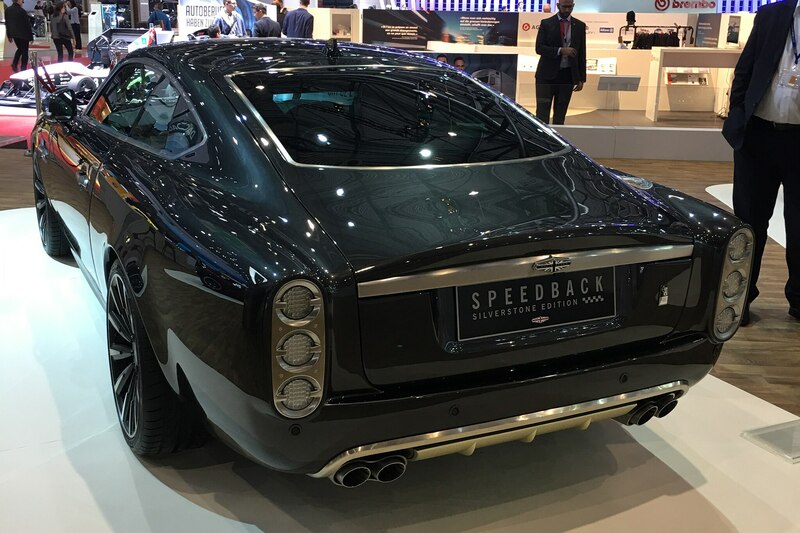 The Speedback GT is a British restomod, with a look and feel designed to evoke a bygone era, but with all of the modern conveniences of today’s vehicles. David Brown says 7,200 man-hours goes into each Speedback GT. At the Geneva show, the man himself unveiled the ultimate version of the car called the Silverstone Edition of which only 10 will be made. It features a unique Silverstone trim kit and power upgrade that has been created as a nod to the famed British track and airfield of the same name. The car has unique tan leather seating with a special broguing done to the leather and Silverstone badge in the headrests. Outside, several special touches have been added to the bodywork, the rims and livery are unique to the car, and its 5.0-liter V-8 has been boosted to over 600 horsepower. If an Aston Martin DB5 is far too much for your bank account to handle, then you may want to look into this hand built machine with a distinct British pedigree. Don’t let its deep mauve metallic paint fool you. 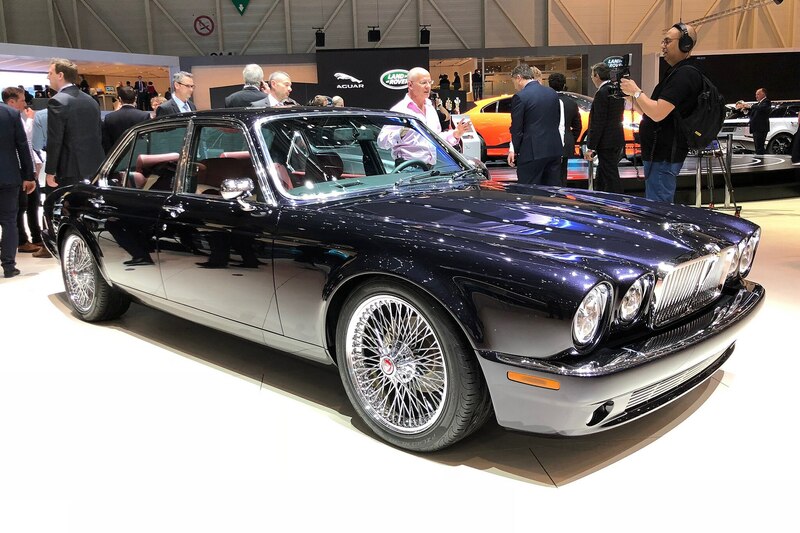 Though I was initially drawn to Nicko McBrain’s 34 year-old XJ6 because of the hue he refers to as “infinite purple,” what really stopped me dead in my tracks at the Jaguar stand were the sedan’s inscrutably honed details. There are the wheel arches, which are subtly flared and enlarged; the signature twin fuel fillers, which now sit flusher against the body; flavorless door handles which have been replaced with elegant Series II grips… I could go on. Turns out no fewer than 4,000 of the car’s parts were altered, requiring a staggering 3,500 man-hours of labor. Though it bears no physical or resemblance to a supercar, maybe that’s the counter intuitive appeal of this dramatically reworked XJ6: the delight lies all in those carefully executed details, and that extraordinary level of obsessiveness is what makes this restomod a winner. That an OEM can rival Singer Reimagined in terms of fetishistically executed restomods speaks to how Jaguar values its past. All automakers should be so willing, and we should all be so lucky to have such inspirational donor cars. Geneva is all about boys and their toys, and the next sexiest thing to a stonking hypercar here is six-figure wrist candy. 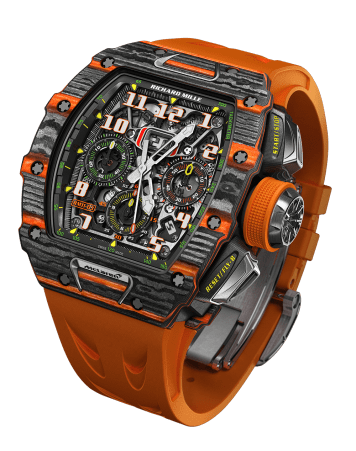 The latest revolving door of watch/car partnerships is the mashup between McLaren and Richard Mille, the high-dollar watchmaker fresh off a year-and-a-half long fling with Aston Martin. Their first lovechild is the RM 11-03, packing a kaleidoscope of psychedelic finishes whose intricacies are best observed through a loupe. From intertwined carbon and silica filaments to a variable geometry rotor, the watch is a miniaturized compendium of advanced, low friction materials and meticulously engineered movements… sounds familiar, eh? If you’re looking at the $290,000 McLaren’s 720S, the inspiration behind the RM 11-03, you’re right on the money: these are two technically ambitious brands linked by their fondness for advanced construction and OCD attention to detail. But that teensy wristwatch packs a stupendous financial density with its $191,500 price tag, making it two-thirds the value of the 720S, only packed into an infinitesimally smaller space. Even more astounding? Production will be limited to 500 units, a number that would theoretically generate $95 million in gross revenue. Kind of takes your breath away, doesn’t it?